Cancer Research Centre: What happens when you quit SMOKING ??? 1. After 20 minutes :- When you quit smoking, right after 20 minutes the heart beat and the blood pressure are dropped again to the normal conditions and you feel somewhat relaxed and cool. 2. After 12 hours :- there is a major change after 12 hours in the body and the toxic blood due to the presence of Carbon Monoxide becomes nontoxic as the level of carbon monoxide drops to normal. 3. After 2 weeks :- the lungs comes to such a position that they start working normally and the functioning is improved as the circulation of air by the lungs improve. 4. After a month :- the ill effects of smoking like the shortening of breath and other ailments like cough becomes less vulnerable. The functioning of lungs improve and the side line hairs of the lungs start working properly and they clean the lungs that were before causing infection to the lungs. 5. After 1 year :- Smokers are at a high risk of heart diseases. After 1 year of quitting cigarette the risk of heart disease is reduced by 50%. 6. After 5 years :- Smokers are at a high risk of various cancers like esophageal cancer, mouth cancer, bladder cancer and cervical cancer but after 5 years of quitting smoking the risk rate is reduced by 50%. 7. After 10 years :- The death rate of a smoker is more than that of a non smoker due to various ailments that they acquire by smoking. After 10 years of quitting of smoking the risk of death by the deadly pancreatic cancer and larynx cancer is reduced by 50%. 8. After 15 years :- After this term the risk of heart disease to the quitter becomes equal to a non smoker. 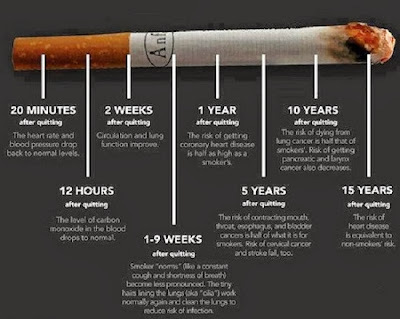 This was the effect on body when you QUIT SMOKING and I personally recommend you to QUIT SMOKING if you are smoking right now because the pleasure it gave you for few minutes takes away everything from you after sometime. So to QUIT SMOKING is the best way out to live a dignified and healthy life. 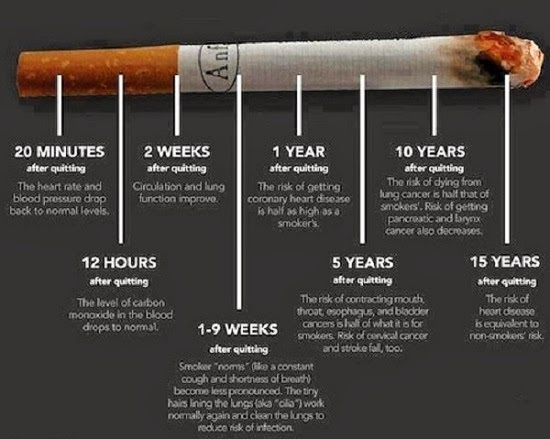 Labels: effects of smoking, quit smoking, What happens when you quit SMOKING ?? ?